I could have but didn't for a couple reasons. Running for 30 minutes, I wanted all cooling air over cylinders during the run. I will have a 4 foot fan blowing over the engine during the run to move heat away. Also, if everything is right, engine is ready for installation. Plus it looks better in the video when it runs. 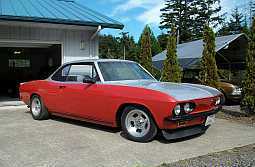 All I got done today was get the nut plates for the engine shrouds and modify the front shroud. 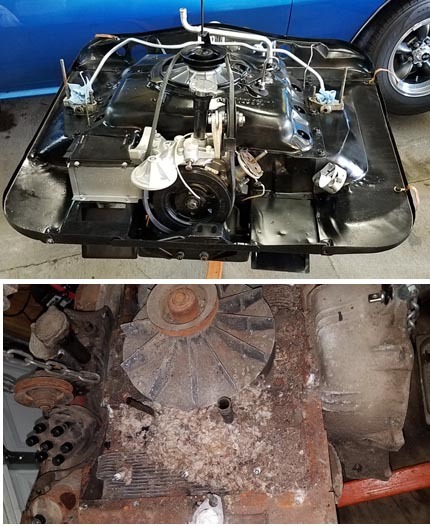 I converted a nice 66 manual transmission front shroud into a 66 automatic front shroud. Tomorrow I get to work on cleaning and painting it and finish painting the fan shroud. Got to get lower shroud bolt hole areas brazed as they have cracked on 4 of the 6 holes. We got the fan shroud and front shroud through the cleaning and painting process this morning. They will be installed tomorrow. 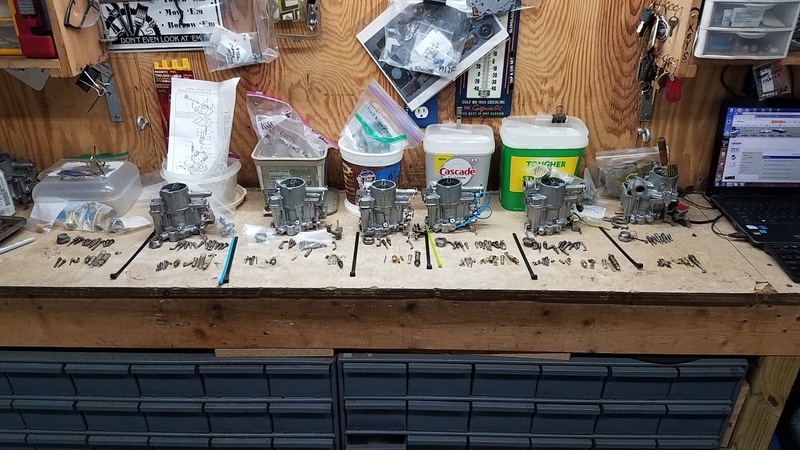 This afternoon I will teardown a set of carbs I have had soaking in mineral spirits since we started this engine repair process. A matched set of 7026024 of one of the LMs I dismantled. Can anyone tell me what is the best jet I should have in these carbs for todays gas? Just received my carb kits and accelerator pump cups from JASVAIR a couple hours ago. Just in time for the carb rebuild. 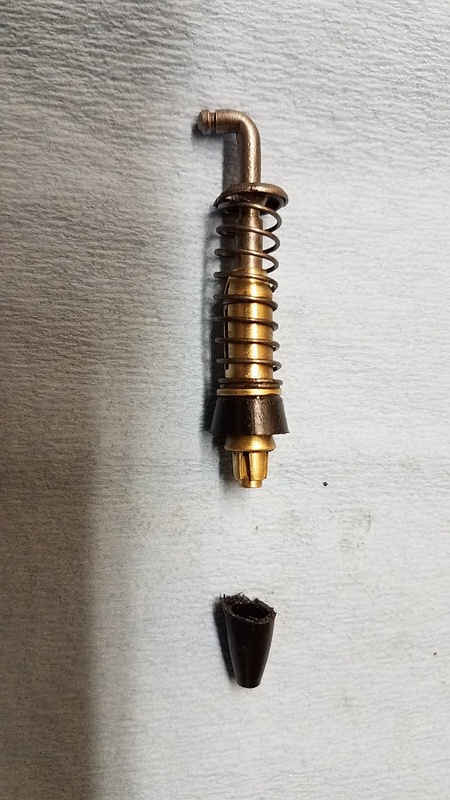 Spark plug holes had thread chaser run in them. Front shroud sealing foam installed. Shrouds on top of engine completed (knowing front shroud must be removed for transaxle installation). Right cooling box and piece between both boxes installed. Skid plate and engine mount bracket were removed for cooling box installation and now reinstalled with sealing foam. Coil mount, balance tube, air cleaner bracket, dip stick grommet and vent tube bracket & gasket installed. Balance tubes connection tubes and plugs removed removed from heads due to corrosion. Carbs are in cleaning process. One fully disassembled, other is split at top cover with only with top cover disassembled. I did note that we needed some more items from Clark's for the assembly and installation. Shopping list being double checked now. Also sent an order to Jasvair. Looks a little better than when you started. Time and patience, but I also had family issues that interrupted the build for about 80 days. Probably also doing more with my Mouse House 110 that you are doing with the Banging 110, Matt. Anyway, it looks about 10% better than what I started with I guess. If you consider I have all the same parts and just added paint here and there. Oh yes, Matt. This is my first build where I got to replace from pistons on out. I have stripped 9, but first build. Giving me practice for my Big Valve 110 engine. How many have you done? Edited 1 time(s). Last edit at 08/17/2018 04:25PM by Lane66m. I got the second carb fully disassembled. So the question I asked previously still stands. What is the size jet that should be used on this 110 with a PG attached to it? Car will be used in a sea level to 1000 ft altitude locations. Mainly, level to small grade inclines will be experienced. Right now both carbs have 51 jets. These are 6024 carbs from what I can determine. 0 rebuilds.... always fixers or used parts builders.. I'd say it looks 1010% better! Now to get the carbs rebuilt. Been reading a lot on jetting. Thinking may be alright with 52s with these carbs. Once those are done and mounted, then it is onto setting up for the run. Got a few wires and plugs/ terminals to put together to set up for the start & run operation. Already got battery cables for the setup. Got the 2 carbs disassembled I will be rebuilding, BUT I did an evaluation of all my carbs. Seems I have a set of 66s on the Greenbrier I will remove and update. I will remove the top cover and install the Viton Accelerator pump cups. 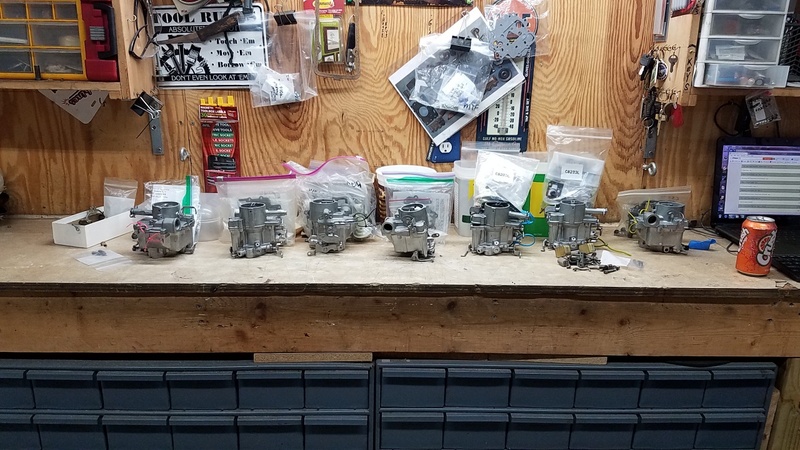 These carbs will be used for the Mouse House 110 engine. I have a set of 65s torn down previously that will be finished up and mounted on the Greenbrier. I have another set of 65s that will be set aside for another engine. That leaves me with the set of 66s I have torn down this past week. They will be rebuilt with Viton cups and preserved and stored. 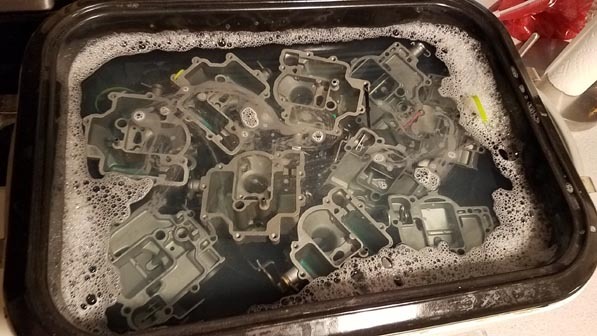 Here is a shot of the 6 torn down ones having their hot water and Dawn bath. They have been bead blasted already with #13 ultrafine glass beads and look real good. All ports are clear and mechanisms rotate freely. 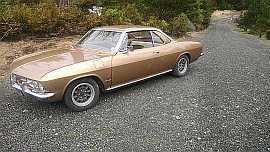 Have a certain car in mind for this engine rebuild? We have gold one sitting around. Just haven't decided if it is the one yet. Still got a Greenbrier with an 80 hp that could use a little more power. So the rebuilding will commence soon. I have to go get carbs off Greenbrier and upgrade them to Viton accelerator cups first. Well, I did not get to remove the Greenbrier carbs today. I will get them removed first thing in the morning. Decided to make sure I had all the parts for all the carbs I disassembled 4 months ago. And also to make sure rebuild kits had everything I need to put them back together. Needless to say, I am missing some parts due to age deterioration and loss. John Sweet is shipping me 3 accele3rator pump springs and retainers. Those had deteriorated beyond any possible further use. 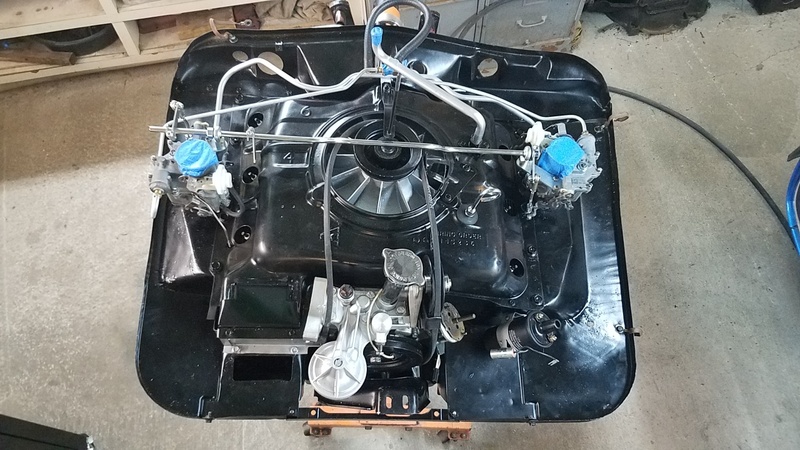 The 1963 carb has been sacrificed to provide some more needed parts. I am getting a shopping list up with Clark's which I will check around with our other vendors also to see who has what. Surprising Clark's doesn't list the accelerator pump spring that is retained on the pump shaft. 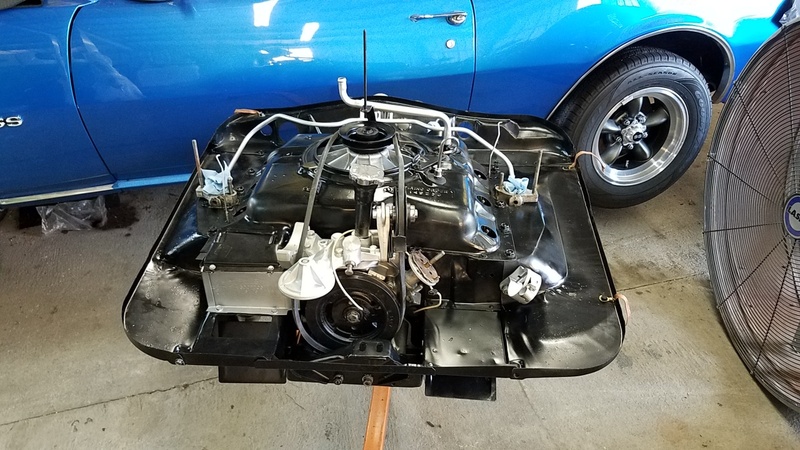 The 61 carb still may be sacrificed for this project to get the 7 carbs on the bench rebuilt. Here is what my bench looks like right now. We got the carbs off the Greenbrier this morning. 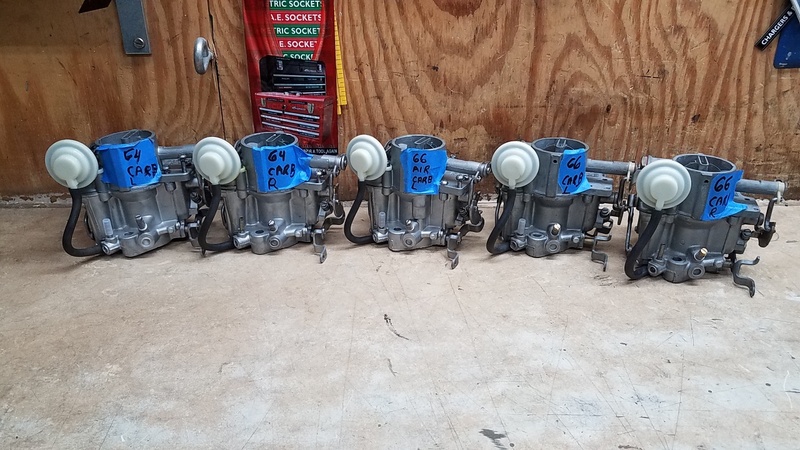 Rebuilt the original Greenbrier carbs, so they are ready to be put on the van. Updated the ones that came off the Greenbrier with Viton accelerator pump cups and .052 jets. While the assembling the fifth using Bob Helt's book, I realized the choke links had been put on wrong. 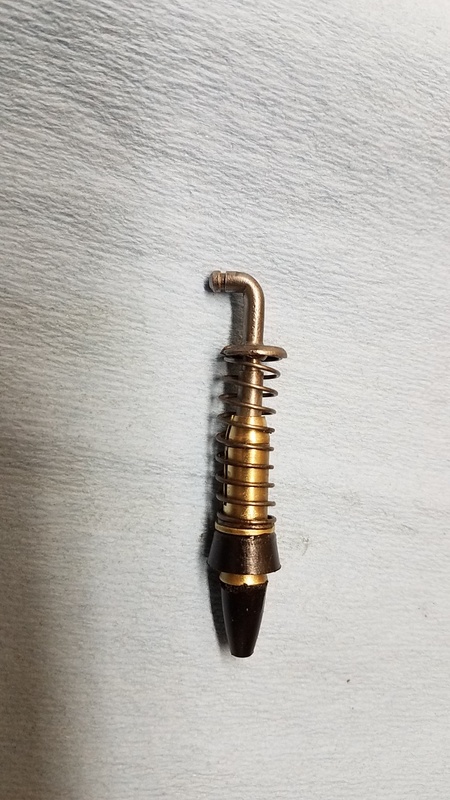 I was putting on using one of the old carbs I have that was not disassembled. I just happened to turn to the page showing the correct orientation of the link. Only have to correct 4 of them by reversing top to bottom. Used Dave' BIC pen cap idea for the accelerator pump cup installation. I worked like a charm. I also had no issue removing the new black nitrile cups off the pumps without damaging them. I did lose 3 floats due to corrosion and leaks. But I have 3 more 66 carbs that may be disassembled to get parts to finish up these 5 that I have kits for right now. Balance tube connection tubes and plugs installed into the heads. Carbs with gaskets and insulators are installed. Balance tube connected and bolted down with air cleaner bracket being installed also. Left lower shroud assembled with thermostat, bracket and heat shield. Installed foam gaskets on shroud. Installed shroud onto engine. Connected up door to thermostat rod. Right lower shroud assembled with thermostat, bracket and heat shield. Installed foam gaskets on shroud. Found 3 bad holes on head for shroud bolts. I will get them heli-coiled in next few days. Pulled out Roger Parent's engine throttle system modification to become familiar with it. It will be installed tomorrow. Photos after lower shroud is installed and throttle system is installed. We got a to do package put together to take to the car tomorrow. Alternator and torque convertor will be there for installation. Instructions to install Roger's throttle system on the engine. If I get time I will get to the heli-coil installations. I puttered around today making a test harness for the engine to run on the ground or my engine test stand. 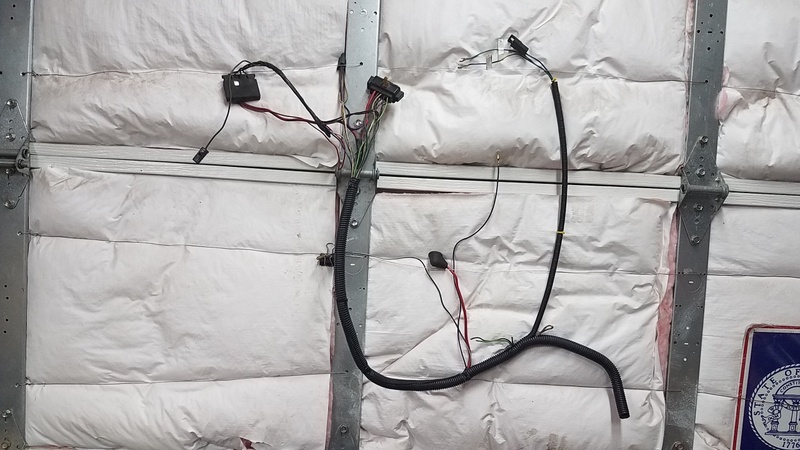 This harness separate the overheat switch and low oil pressure switch. It also has provisions to run an electric pump. I have an alternator patch kit to allow running original Vair alternator or the updated 3 wire internally regulated alternator. I have a small test equipment box my dad used for testing that I am converting to add the needed lights and switches on. Yep, I know, it is not needed but why not go with it if time is available and materials. Yesterday we installed Roger Parent's modified engine throttle system. Simple installation. Also installed fuel lines to carbs. Since I am using electric pump, lines are routed in front of the fan. Had alternator positioned for install and realized a foul with oil pressure connector would occur. I have the PS 64 switch and connector (Chevy Vega Switch) on this engine. Held off until I rounded up adapters to reposition switch. 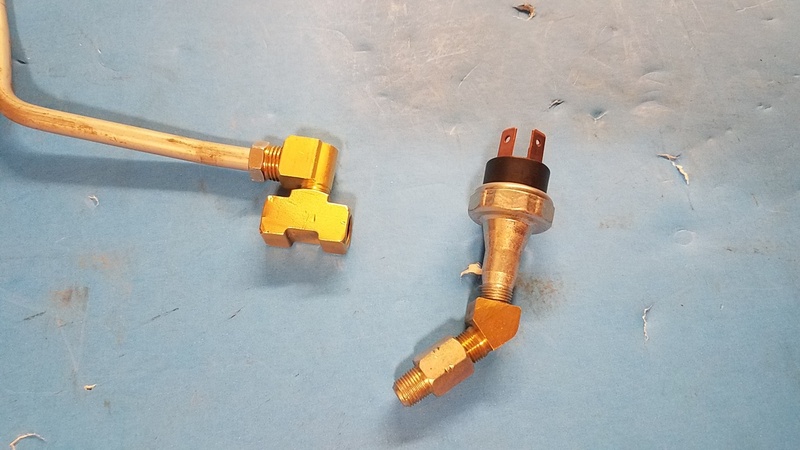 Today I located the needed adapters for the oil pressure switch repositioning and to connect 5/16 main fuel line to new connection point at fuel line block at front of fan. Looks like tomorrow will get those items taken care of. Just have to cut and bend the main fuel line to go to the location.